Pop up tents or Instant tents are quick and easy to put up. They usually take 1 to a few minutes to set up. The poles are already attached to the tent for quick and easy set up. You simple unfold the tent and extend the poles. They are great for those who don't want to deal with trying to fit poles in the right places or want to set up their camp quickly. Coleman has a collection of instant tents. These are 2 of their family camping tents. The instant Cabin 8 with fly is a 2 room tent 14'L x 8'W. It is a nice looking tent. Coleman also have an Instant Cabin 10, which is 14'L x 10'W, which I think is better space wise depending on the amount of people. That additional 2' in the width will provide more space for your children to play in and to be able to move around in. The English version of a Coleman Instant Tent is considered only a 4 person tent, which is what I like. A place to sleep and space to play or eat, etc. Ozark also has pop up tents. The Ozark 16 x 16, 3 room instant tent is a nice designed tent. 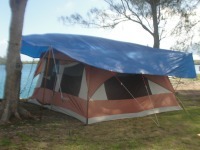 It is a 3 room tent with a covered porch area. Each room is 8 x 8 and the awning area is 8 x 8 making a square cabin tent. 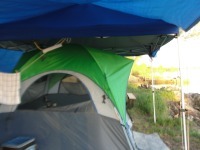 Then there is the Ozark Trail Tent 13 x 9 pop up tent. This tent is really easy to put up and take down. 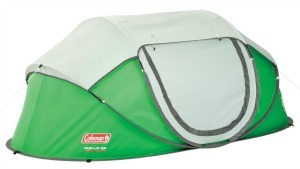 Coleman also has a 2 Person instant tent. Customers say it is easy to set up, sleeps 2 average people comfortably, and is great for an overnight or weekend trip. One con is that you have to get out of the tent to adjust the flaps for ventilation. I also found Coleman 2 in 1, tent and shelter interesting, since my friend usually sets up an instant canopy over her tent. It is a Coleman 2 in 1 tent and shelter. The total dimentions are 14' x 9'. It is able to hold 2 queen beds. I would think you couldn't easily move around in this tent with 2 queen beds inside, but that gives you and idea of how large the inside space is.